Gain a Middle Eastern perspective while earning an American degree. Medill’s onsite presence in the Middle East has been in place since 2008 as part of Northwestern University in Qatar (known as “NU-Q”). NU-Q’s space, which is located in Doha’s Education City (an area that houses facilities from leading universities), offers 515,000 square feet of space dedicated to Northwestern’s use. This new, permanent space opened in 2017 and is three times as large as Northwestern’s previous location in Qatar. The facility is impressive and modern, crafted to encourage interactions between students and faculty as well as serve as a place to present and share information easily and informally. 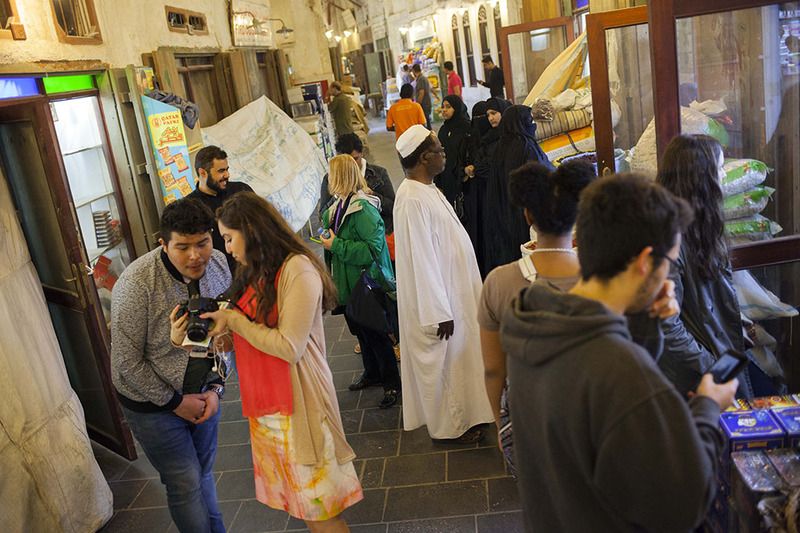 Medill students look at a photo on a camera during a visit to Souq Waqif, a traditional market in Doha. In Qatar, you can earn a full undergraduate journalism degree. Or, as a Medill student, you can choose to spend one of your semesters in Qatar or Journalism Residency in Qatar. Either way, you will be exposed to the unique landscape of journalism, media and communications in the Middle East and will be armed with skills to help you break into that market.